I have a customer with a combo gripper-camera. First solution, we change the cable of the camera for another (new).... But, we continue with the same problem. I have uninstalled all URCaps. 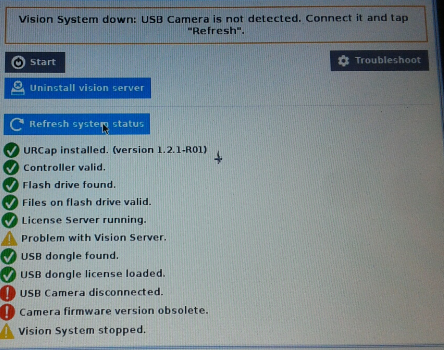 We have updated the UR to the latest version 3.4.5.100 and installed the last URCaps UCC-1.2.1 of the camera...But, we continue with the same problem. P.D. The LED has a mixture of red and blue.(Purple?). Hi @Enric, a purple LED usually means a firmware issue. I opened a support ticket to help you with that. I have the same problem. Anyone has the solution for this issue? Thanks. Hello @vitors, I opened a support ticket for you as well. We have also the same problem. May we could get our own support ticket? Thanks. I opened a support ticket for you.